It's been nearly two weeks since a torrent of over a billion gallons of coal ash sludge spilled out of an impoundment pond near a massive coal plant in Harriman, TN, but the full horror of the disaster is still being revealed. Yesterday, preliminary results of independent water testing showed dangerously high levels of toxic heavy metals at three locations near the environmental disaster, which spans over 300 acres of land and water at the confluence of the Emory and Clinch Rivers in eastern Tennessee. And today, the EPA confirmed that elevated levels of arsenic can be found in the coal sludge now caked over the area. 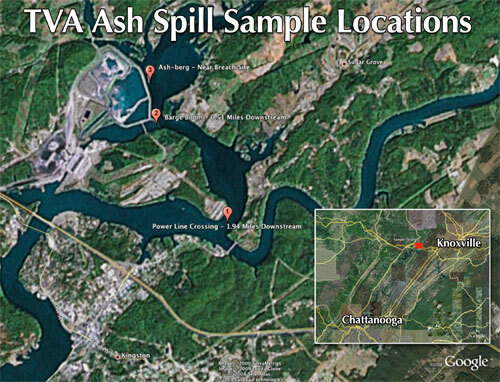 The Tennessee Valley Authority (TVA), which operates the Kingston coal plant previously said the spill shouldn’t cause “any adverse health effects” unless people “regularly drink untreated river water” downstream from the plant. EPA has also said preliminary testing results show the drinking water in the area is safe. Now however, independent testing conducted on water samples from the Emory River by scientists working in coordination with Appalachian Voices and the Waterkeeper Alliance has found concentrations of eight toxic chemicals ranging from two to 300 times higher than safe drinking water limits. Tests were conducted using standard EPA procedures and results were analyzed by scientists at Appalachian State University. “Although these results are preliminary, we want to release them because of the public health concern and because we believe the TVA and EPA aren’t being candid,” said Robert F. Kennedy, Jr., chair of the Waterkeeper Alliance. While EPA still contends that drinking well and treated river water in the area does not pose a risk, they have confirmed that the sludge, which TVA had initially told residents was harmless, actually contains dangerously high levels of arsenic that would normally warrant a response under agency protocols. Arsenic is a natural element found in soil and minerals, but exposure to it can cause sickness, according to the National Institutes of Health. Residents of the area are worried that when the coal ash dries, it will be blown around in the wind, easily filling their lungs with the arsenic-laden ash particles. "We have a 2-year-old daughter whose health is not worth the risk, even if it is a minuscule risk," said Suzanne Solomon, who rents a home about 2½ miles downwind. "I am an opera singer with mild asthma [and] I do not wish to expose [my lungs] to any dust which might become airborne. ... I do not see any way that they can keep all of this out of the air." 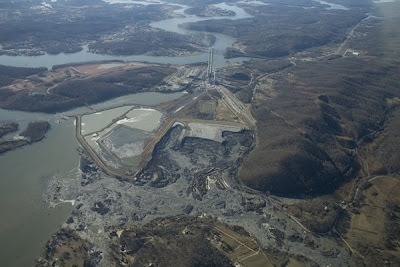 The coal sludge spill occurred on December 22nd, and covered over 300 acres of the eastern Tennessee county with several feet of inky black muck, destroyed three homes and damaged 42 other properties, and contaminating the nearby Emory River, a tributary of the Tennessee River which supplies drinking water for thousands. The disaster occurred 35 miles southwest of Knoxville, Tennessee. well this is going to be a big big disaster.